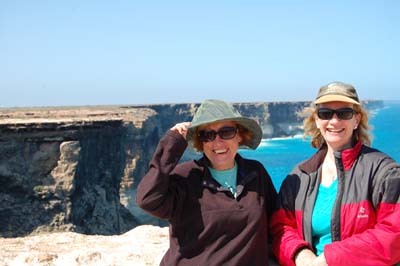 When we were sitting around the campfire with Natalie and she said she was going caving to the Nullarbor, Wendy and I immediately signed up for the trip. Not that we were the world’s best cavers, but this was an opportunity too good to pass up. For two people who hadn’t done any travelling together it was risky, but, we had a ball! 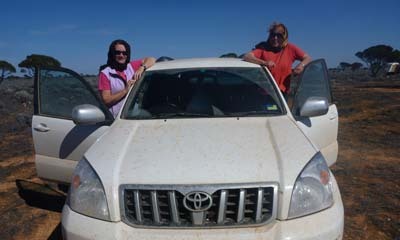 Wendy borrowed Bob’s Prado for the trip, her Forrester just wasn’t up for the rigors of driving in the outback. We loaded up all our staff and headed off for Cobar, our first stop, a massive 770k on our first day. This was to be typical of the trip, we just “fanged” it according to Wendy, who just loves to drive! We had heaps of cds to play and just sat back, enjoyed the scenery and listened to our favourites (definitely Peter Allan) and decided on music we wouldn’t ever listen to again (CCR). We passed a beautiful scene of a farm house on a hill with a field of flowering canola in front of it, we both agreed we should have taken a photo but didn’t! That sort of was the way the trip went, we didn’t stop much for photos, just tried to take them out of the window of the speeding bullet! We saw lots of emus, in fact the emus were a worry for Wen, she didn’t want to crash into one crossing the road in Bob’s Prado, and they just have no road sense, they just dart out in front of speeding cars! Also saw lots of feral goats, didn’t see any feral camels though! 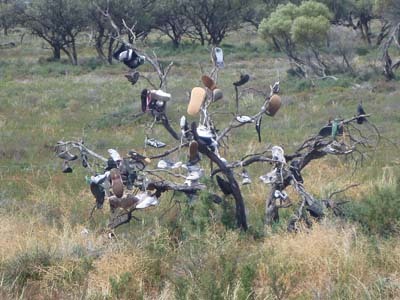 But we saw a bottle tree and a shoe tree, some people are really creative. At Cobar caravan park, we met up with Natalie (the organiser) and her teenager son, Josh. We headed out to Broken Hill the next day, not such a big day, only 450k. 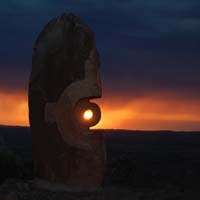 We did a bit of a drive around Broken Hill because Wendy had worked there briefly so knew her way around and then we ended up at the Sculpture park out in the desert where a number of sculptors had created beautiful works of art in the desert. which is not even a 2 horse town). 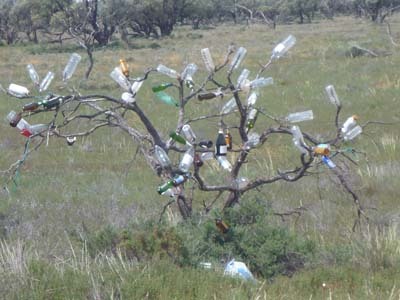 The town was a bit like something out of Deliverance; we stopped someone on the side of the road and they said “go down and see Errol” (well, that wasn’t his name but you get the idea) “he’ll have some”. So we drove down the road and knocked on the door of Errol and he came out with a jerry can. It was bizarre, where else would you go and knock on someone’s door for diesel! So, we were out of the woods and had enough fuel to take us to Ceduna. 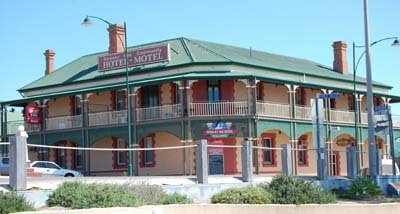 A t Ceduna we rocked up to the caravan park, this is where we were to meet up with the rest of the group, we arrived there a day early and booked into our room, very, very basic, but we were just glad that there was room at the inn. We walked down to the dune and up and over it to the beach, windswept and not at all inviting. Next day we did a bit of a drive around Ceduna and when we got back there was a group of people checking in and Natalie was amongst them, so this was our group. Wendy and I looked at each other and both thought “what have we done!” we were a bit apprehensive, some of them looked like they too were out of Deliverance! Ah well, it’s an adventure. 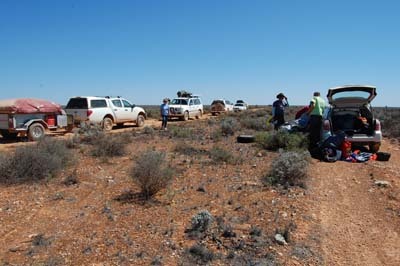 Next morning we all checked out and started the road trip to Nullabour Roadhouse and our first cave. 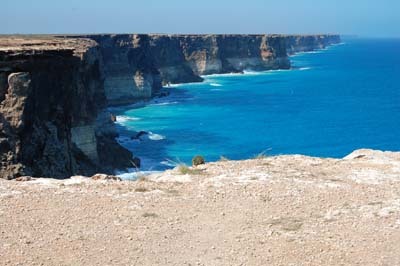 We stopped along the way to view the Great Australian Bite – unbelievable scenery! The best part was the whale viewing platforms just off the highway. There were heaps of whales cavorting just off the coast, you had to pay a small amount to get in, but the viewing platforms were really good and you could actually get quite close to the whales and the baby whales, we spent a lot of time there, it was just so cool. We duly arrived at the Nullarbor Roadhouse (420k from Ceduna), a bit of driving out into the mulga scrub and we were at our first campsite and first set of caves. We did Murrawijinie Caves, and Weebubbie Cave and then Abrakurrie Cave, then started our drive through to Forrest a mere 250k. Now, Nat had expected that the road would be a little better than it was, in fact it was downright scary and one of the group got two flat tyres. This was a bit of a problem as he had only 1 spare (despite Nat telling him that he should have 2!). So, one of the other group forfeited his spare tyre so that he could get his car to Forrest, where we’d leave it until the end of the trip, then go back and retrieve it. Forrest was Wendy’s Peak Experience. This is a little town on the Nullarbor and it’s a railway station, a few houses and an airstrip. 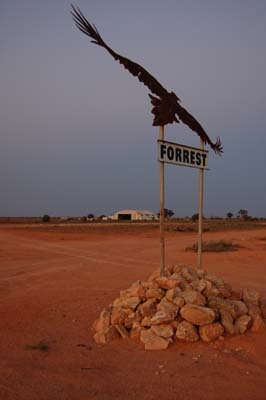 This airstrip is where the aircraft landed back in the olden days when they didn’t have enough fuel to do the leg from Sydney to Perth, so they landed at Forrest to refuel. They even off-loaded the passengers and gave them a sit down dinner while they refuelled. The airstrip is still maintained as it’s the only one that is big enough to take the large jets of today, and it’s a place for light aircraft to refuel if they need to. There is a couple that live there in a house and their job is to look after the place. Every couple of days, a person comes along checking the Indian/Pacific train line for faults (he has a cool vehicle that can be driven on roads, but when he wants he drives up onto the railway track and drops down some railway wheels and then drives along the track). This is the main train line between Sydney and Perth and a train goes through every day, occasionally stopping to let someone off, or deliver fresh food to the caretakers. We spent the night at Forrest and Wendy spent a lot of time pottering around the old buildings. It was out in the middle of no-where and the wind just didn’t let up (in fact it had been windy and dusty ever since we arrived at the Nullarbor!). Next we drove down to Old Homestead and did some caving there, then Thampana Cave drove down to Madura for our final cave Mullamulang and in to Eucla the end of our caving experience, the highlight of Eucla was our first real hot shower with heaps of water! Of course, whilst in Eucla we checked out the old Telegraph Station (right on the border, two operators, one for WA and one for SA, in different rooms, operating different key boards, and handing a message through the window for forwarding on). We walked down to the beach and checked out the ruins of the old jetty, they had to have all their supplies shipped in by boat. We had our final get together at Eucla and then Wendy and I fanged it for home, first stop Ceduna (500k), we booked into a lovely hotel at Ceduna, right on the water and enjoyed the sunset over the ocean. Next day we took the time to do a little sightseeing so we drove down to Streaky Bay for lunch in a beautiful restaurant on the ocean. It was here that I parted company with my Credence Clearwater Revival cd, I swear to god those guys must have been taking a massive amount of drugs when they did that cd, you couldn’t understand a word they sang. So, I put it down on a park bench across from our restaurant and then we watched to see who would pick it up to take it home … a nice elderly lady popped it in her bag. Next day we fanged it for Broken Hill (stopping briefly at Port Augusta for some souvenir shopping). At Broken Hill we did a bit more sightseeing up at the mines. Next day we pushed through to Dubbo (770k). We were on the homeward bound leg now and we celebrated at Dubbo Golf Course with champagne and oysters. I’ve never done a road trip before, but have to say it was a great experience. The conditions weren’t fantastic, in fact we experienced two weeks of wind and dust, the wind was so strong at times that you had to be careful of the car door otherwise you’d be bashed or squashed. The dust was everywhere, throughout the car and in our tents, you couldn’t get away from it and it dried out your skin terribly. 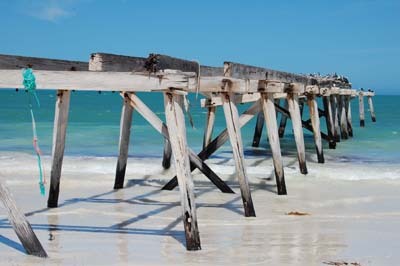 The Wind and Dust were the reasons why we splurged at Ceduna, we felt we deserved it! Would I go back again, for the caving, yes in a heartbeat, but don’t think I need to drive across the Nullarbor again, it is interesting to see miles and miles of nothing but scrub, with the occasional (very occasional) tree thrown in, what they were thinking when they created these massive cattle stations is beyond me, the only thing that’s plentiful is land, nothing else. This entry was posted in Caving, MSS, Road Trips. Bookmark the permalink.